The College of Education (COE) at the University of Missouri – St. Louis (UMSL) understands the demand for quality and accountability in Educator Preparation programs. We strive to ensure that our program is accessible, affordable, and relevant to the needs of today’s education professionals. Our program works collaboratively with local school districts to assess the current needs of K-12 schools and how we can best serve them. In creating partnerships with practitioners, researchers, and education innovators who are at the forefront of affecting change in their professions we can ensure that our program is directly representational of the current demands upon on today’s professionals. Whether you are in a classroom now and need certification, you are interested in Teach for America, or are thinking about education as a career field, we have accelerated programs that are flexible, experiential, and will prepare you for the classroom. Ready to get started? Reach out to one of our friendly and enthusiastic professionals who have the resources to help you. What is a Missouri Alternative/Provisional Certificate? What is the Academic Contract? What happens if I breach the Provisional Certificate requirements? Once the resident teacher has obtained provisional certification, UMSL will monitor his/her compliance with all requirements necessary to maintain license/certification and will notify both the school district and the Department of Elementary and Secondary Education in the event that he/she is in jeopardy of forfeiting his/her certification/license. In the instance that a resident teacher has breached the requirements, he/she becomes ineligible for UMSL's alternate certification program. Can I earn a master's degree with certification? Yes. In addition to earning teacher certification, participants can earn a Master of Education (MEd) through the program. The master's degree requires an additional four to five courses depending on the certification area. All candidates seeking educator certification in Missouri are required to achieve a passing score on the appropriate Missouri Content Assessment (MoCA) by August 1. Candidates must also complete the Missouri Educator Profile (MEP). While not used for admission into the program, the MEP provides an assessment of work style preferences used to support the development of effective educator work habit. No. Candidates apply through the UMSL Graduate School for admissions as a Master of Education Candidate. While all transcripts are required, the GRE and GMAT are not required for this program. The program includes online courses and a school-based internship. Program courses are offered over a 2-year cycle and are designed in a modular format as opposed to discrete course silos. 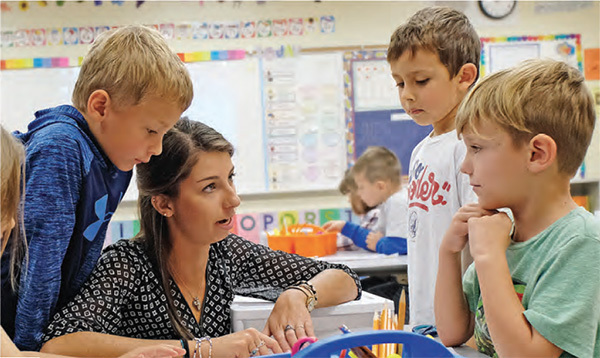 All resident teacher candidates are recruited, hired, and placed by the school district's personnel. UMSL serves as the partnering university for certification. Does it matter if I teach in an area other than my certification? Yes. DESE requires that applicants complete two years of teaching in the chosen area of certification. What is the final step to earning teacher certification? During their final semester, candidates must have passed the final DESE assessment known as the Missouri Pre-Teachers Assessment (MoPTA). Upon completion of all assessments and courses with a minimum GPA of 3.0, UMSL will recommend candidates to DESE for certification. Choose the certification that's right for you. UMSL's innovative Teach Residency program offers post-baccalaureate teacher certification in as little as 12 months. Aspiring candidates must already hold a bachelor's degree and must pass the appropriate Missouri Content Assessment prior to admission. Explore our teacher certification tracks below. Non-certified St. Louis City teachers of record earn MIssouri certification online in 6 semesters, includes option of MEd. Non-certified teachers of record earn certification online with six courses over two years, with an optional MEd.